Innovative companies vs. in-NO-vative companies: Who’s who? Take a moment to think about the following questions: What innovative companies do you know? 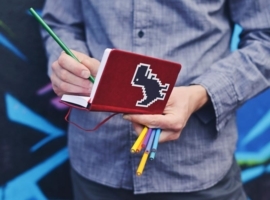 What companies do you consider to be highly creative and innovative? What factors have made these firms become innovation leaders? Would you want to work for one of those innovative companies? Why (not)? What innovative companies do you know? When we train or consult organizations at Thinkergy on how to build more innovation-friendly companies, we ask these questions as a warm-up exercise. While the smaller creative ventures and local innovation heroes vary in different countries, some well-known firms appear on the delegates’ list of innovative companies, with Apple, Google, Amazon often featured first. Many businesspeople also intuitively have a good understanding of organizational and cultural factors that differentiate innovative companies from normal organizations. And while a few delegates dare to admit they rather would not want to work for an innovative company (either because their cognitive style favors efficiency and adaptation over creativity and innovation, or because they dislike working in a firm that constantly wants to push the boundaries forward), a vast majority of workshop delegates would sign on at an innovative firm if they got the chance. What in-NO-vative companies do you know? Interestingly, the energy levels rise when the delegates list examples of in-NO-vative “Me Too”-companies — and of the cultural factors that stand in their way. Laughter, cheers. and a bit of disgust mixed with “Schadenfreude” fills the room, indicating that the delegates had their fair share of negative customer experiences with the blacklisted firms and their poor products and services. Having worked in such an in-NO-vative copycat company before, some delegates are even intimately familiar with what’s wrong with these companies. What can we learn from the exercise? Most businesspeople and customers intuitively grasp what innovative companies do right — and what in-NO-vative companies do wrong. They are able to pinpoint many of the striking differences in “the ways we do things around here” in innovative versus in-NO-vative companies. So, if not only highly paid consultants but normal people can distinguish poor from best practice and identify what wrongs we need to right, why isn’t every company innovative? Changing an established organizational culture is a very hard thing to do. It typically takes at least 2-3 years of focused effort to make a successful transition towards a more creative culture, and those inside the organization who benefited from the old culture may resist change or even sabotage it. We discussed already in an earlier article, The Creative Transformation Marathon (Part 1) and (Part 2). What companies lead global innovation rankings? A few well-known business magazines and global consulting firms regularly release lists that rank the world’s most innovative companies. The different rankings vary in the methodology and metrics used to rank innovators, thus producing variations in the firms listed as innovation leaders, but also having some names appear in every ranking. 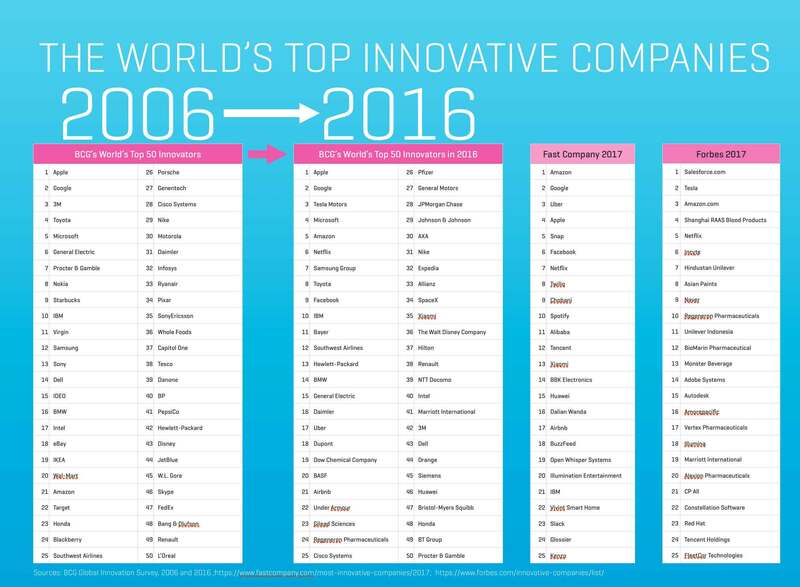 Boston Consulting Group (BCG)’s annual list of the world’s top innovative companies is my favorite ranking. Because it has been done consistently every year since 2005, it allows us to see shifts and trends in the populace of innovation leaders over time. BCG has steadily evolved its ranking methodology, adding over time objective financial metrics (such as total shareholder premium, revenue and margin growth) and cross-industry ranking to its initial approach to having executives subjectively rank the most innovative companies inside their industry. In 2006, BCG’s ten top innovators read (in rank order): Apple, Google, 3M, Toyota, Microsoft, General Electric, Procter & Gamble, Nokia, and. Starbucks. Ten years later, Apple, Google, Microsoft, and Toyota have managed to stay in the top 10, but are now joined by new top innovators that have emerged in the past decade (such as Tesla Motors, Netflix, and Facebook) or have moved up in to the top 10 (Amazon, Samsung, and IBM). Forbes ranks a firm’s innovativeness based on sales growth and their “innovation premium” (defined as the difference between their market capitalization and the net present value of cash flows from existing businesses (based on a proprietary algorithm from Credit Suisse HOLT)) they achieved. Thereby, Forbes only considers firms with seven years of public financial data and USD 10 billion in market cap. Moreover, Forbes only focuses on industries investing in innovation, excluding non-R&D intensive industries such as banking and financial services or energy and mining. In contrast, Fast Company ranks innovation leaders overall and in many different business segments based on the impacts of recent innovative contributions that they’ve made. Thereby, Fast Company blends subjective editorial judgment with objective artificial intelligence that mines and topographically maps out millions of innovation-related news articles, blog posts, company profiles, and patents across more than 40 sectors to identify trends and the companies that drive them. Due to the different ranking approach of Fast Company, many smaller creative agencies and tech firms (that don’t size up to the BCG or Forbes lists) achieve top ranks alongside the usual suspects. Nike. Consistent presence in the BCG list indicates that these companies have cultivated innovation-friendly cultures that are unswayed by top managers and management fads coming and going. In fast-moving industries such as technology, today’s innovation leaders may lose their relevance and drop out of the rankings quickly if they miss out on emerging technologies (Blackberry, Motorola, Nokia). Innovation seems to increasingly be moving to Asia: In the past, innovation leaders mainly originated in the US, Europe or Japan, Recent rankings indicate that dynamic innovation increasingly takes place in Asian Emerging Markets (most importantly China and India, but also in smaller countries like Indonesia, Malaysia and Thailand). Innovation shifts from industrial to digital: Ten years ago, many innovation leaders were industrial companies (3M, Toyota, GE, BMW, Honda), while recent rankings are increasingly dominated by new the “digital innovators” that create, market and operate digital platforms (e.g., Amazon.com, Salesforce.com, Facebook, etc.). “Continued innovation is the best means of defeating competition,” noted the famous innovator Thomas Edison. What was already true more than a hundred years ago is even more true today. Whatever company leads innovation in an industry today, it has to continue innovating with a focus on making meaning and on making the world a better place — or otherwise, it will rather sooner or later loose its relevance and will be replaced by a new class of innovative companies. This article is one of 64 sections of an upcoming book that I am presently writing, The Executive’s Guide to Innovation (targeted for publication in 4Q.2018 by Motivational Press). We also touch on this topic in The CooL Innovation Workshop, a 1-day training course to enlighten companies on cultural and organisational factors that support or inhibit organizational innovation based on our innovation transformation method CooL – Creativity UnLimited. Contact us if you’re interested to learn more about our innovation training courses or how we may help your company to do the cool change from in-NO-vation to innovation. © Dr. Detlef Reis 2017.